Some analysts argue that rumors of the death of the mining boom are exaggerated. Asia-Pacific coal miners might disagree, but the resources “super cycle” is far from over, analysts asserted at Brisbane’s Mining 2013 conference. However, the sting in the tail was a forecast for another “shock” around 2018 sparked by a capital flight from Asia back to the United States. 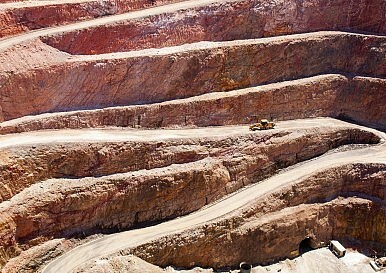 The Diplomat has previously noted the mining sector’s recent decline. Could it be time for a rethink on resources? Blaming deleveraging in the developed world and China’s slowing construction cycle for a “cyclical correction” in commodities, Smirk told the industry audience that the upturn was already underway. “The commodities super cycle may have peaked but it hasn’t ended. In the early days, it was completely missed by the miners and they raced to catch up [to the demand]. Then came cost blowouts as they tried to catch up. Now it’s about productivity and cost controls…it’s no longer about putting in mines at any cost to get the stuff out of the ground as fast as possible,” he said. “There’s more growth from China to come, but that surprise of China emerging out of nowhere, catching all the miners by surprise, is not going to happen again,” he said. Smirk warned miners to prepare for a rough ride, saying the world was heading for a renewed growth spurt from 2015 before crashing back down again around 2017/18 as quantitative easing finally unwound. “China is recovering, but we see a slowdown coming in the developing world around 2018 as the emerging markets experience imbalances and capital flight. We see some adjustment happening to monetary policy and then a slowdown with a bit of an overshoot [by markets]…and prices of commodities will follow,” he said. He said the resources market had shifted downward since April 2011 due to uncertainty over Chinese growth, the emerging U.S. recovery and investors’ search for yield, despite resources being “oversold” in the short term. McLeod told the conference that a recovery would require “clearer growth trends from China and a broader recovery in world growth” in addition to reduced capital flight to the United States. “When is the next resources run? The Chinese economy needs to demonstrate sustainable growth; the U.S. economy is experiencing average growth rates at the moment and the U.S. dollar is a little high at the moment, in our view. We’d like to see some of the emerging markets pick up in growth, and we see that happening in around a three to five-year timeframe,” he said. “China propped up commodity prices during the GFC…the outlook will be China holding its own with 7.5 and then 6.5 percent growth rates by the end of the decade, and then we’ll see a contribution from the rest of the developing world and finally the OECD. This all drives metals demand,” he said. Trench said India “was not the next China” and would fail to meet its target of 9 percent growth, with its GDP growth rate having halved since 2010. “Where is the next China? Actually it’s in China – in central and western China. We expect the coastal strip to move closer to OECD-type [urbanization] levels, the central and western areas to move closer to eastern China levels, and the central-western contribution to output to increase”. The analyst’s positive forecasts were endorsed by local miners who have benefited from Chinese investment, including Brisbane-based Diatreme Resources. “Chinese investors are still showing an enormous appetite for Australian resources, including our company’s mineral sands projects. Urbanization is ongoing in China and will see another 400 million Chinese move to the cities over the next 30 years,” Diatreme’s executive chairman Tony Fawdon said. CRU’s Trench noted that iron ore and coal were still the biggest exports for Australia, with the iron ore miners enjoying better fortunes in recent times. “More money is made out of Port Hedland in one year at the present time [from iron ore exports] than [gold mining town] Kalgoorlie in the whole of its history, so if you had a choice between iron ore and gold right now, you’d rather be in the iron ore business,” he said. Comparing prices to a sundial where noon represented peak prices and midnight their lowest, Trench said iron ore was set to continue enjoying a “long, balmy evening” for a few years yet, while uranium was stuck in the middle of the night until a predicted rebound driven by Chinese demand. However, he said the long-term outlook indicated a future shortage of hard coking coal, while gold would eventually rebound as physical demand strengthened, aided by central bank buying. Trench was also bullish on nickel, forecasting a future supply shortfall, along with tipping a “significant deficit” around 2017 in global zinc supply. The analyst said commodities would heat up again by 2017, with prices to increase by around 17 percent on average, although still around 20 percent off their peaks. As Westpac’s Smirk concluded in his presentation: “The boom is dead: long live the boom.” The region’s miners will be hoping the prediction holds.